Today I've created a lovely little card for my lovely little customer Angela, who won my April Customer Draw for the Love Sparkles stamp set! It's such a gorgeous stamp set & I hope Angela has lots of fun playing with it! I've used the Global Design Project color theme - pick three of the retiring InColours - to make my card, with the images coming from the Touches of Texture stamp set & the sentiment is from the Window Shopping stamp set. 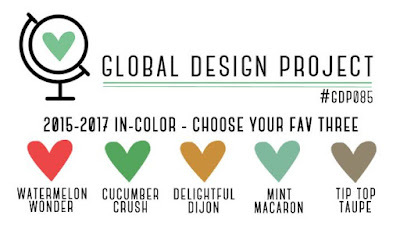 I've used my favourite three colours from the retiring InColours - Tip Top Taupe, Watermelon Wonder & Mint Macaron. I've also added a Silver Foil layer, Clear Wink of Stella on the dragonflies wings & Sheer Mint Macaron Ribbon. I have used my Aqua Painter to take Watermelon Wonder directly to the card from the ink pad. I also stamped the inside to suit, but I forgot to photograph it before I wrote in it! 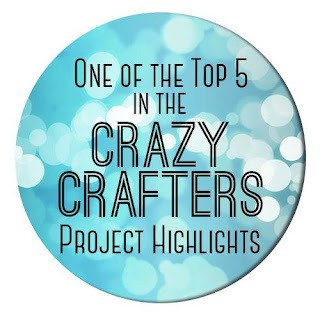 I also entered this card into the Crazy Crafters Project Highlights & was one of the Top Five picks!